The styloid equipment is composed of styloid process and structures connected to it. 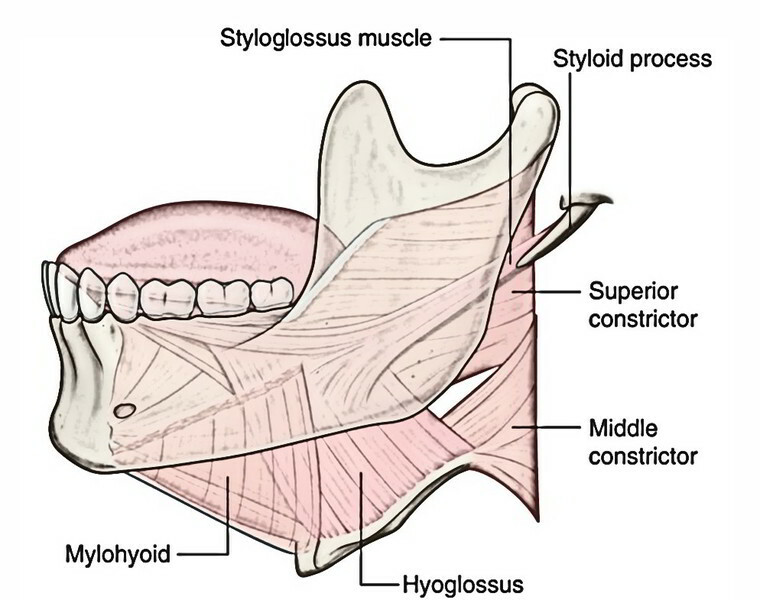 3 muscles: stylohyoid, styloglossus and stylopharyngeus. 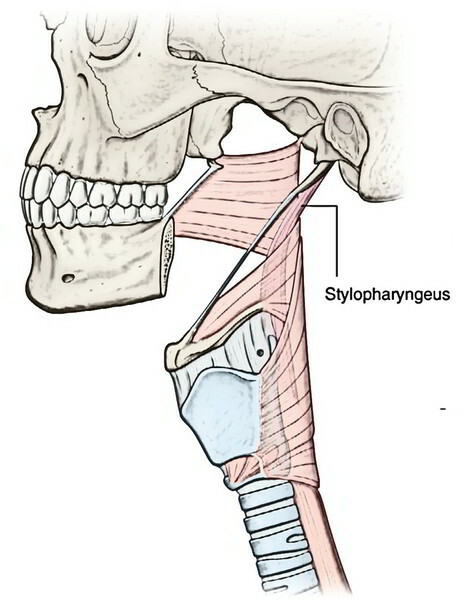 2 ligaments: stylohyoid and stylomandibular. The 5 elongated structures resemble the reins of a chariot and are connected to styloid process. 3 reins (muscles) are flexible, on the other hand the remaining 2 of these reins (ligaments) are nonflexible, with every being controlled by different cranial nerve, example, stylohyoid, stylopharyngeus and styloglossus are supplied by 7th, 9th and 12th cranial nerves, respectively. The styloid process is long, thin, pointed bony process projecting anteroinferiorly from the inferior aspect of thetemporal bone. Its length is variable, ranging from 2-3 millimeters to a mean of 2.5 cm. It projects between external and internal carotid arteries. It’s interposed between the parotid gland laterally and internal jugular vein medially. Laterally, facial nerve crosses its base and external carotid artery crosses its apex. It’s a slight muscle stretching from posterior surface of the styloid process to the hyoid bone in the junction between its body and greater cornu (for details see Chapter 9). It assists in controlling movements of the hyoid bone. 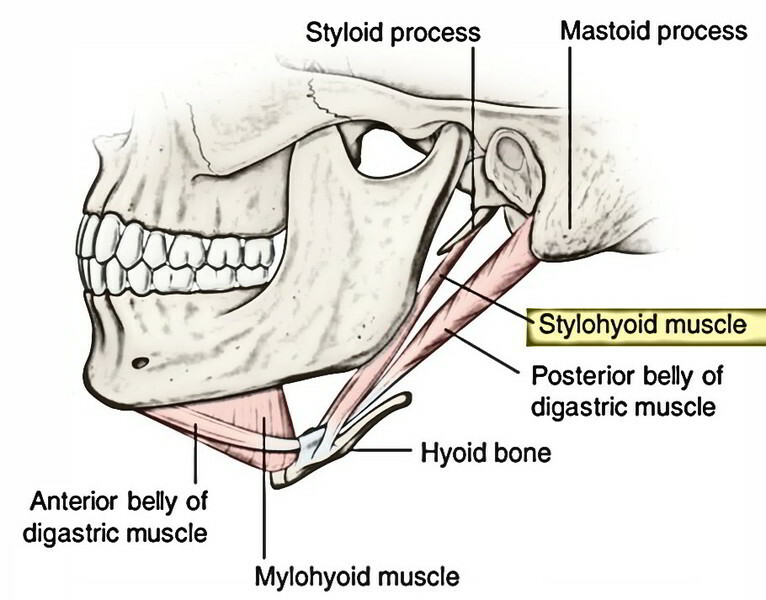 It goes from anterior outermost layer of the tip of the styloid process and adjoining part of the stylohyoid ligament to the side of the tongue. It pulls the tongue upwards and backwards (for details see Chapter 9). It goes from medial side of the base of the styloid process to the posterior border of the lamina of the thyroid cartilage. It can help to elevate the larynx during swallowing and phonation (for details see Chapter 14). It goes from tip of the styloid process to the lesser cornu of the hyoid bone. It stretches from the tip of the styloid process to the angle of ramus of the mandible. Occasionally it’s pierced by the cervical part of the facial artery. Normally, the tip of styloid process lies between the external and internal carotid arteries, just lateral to the tonsillar fossa. The elongated styloid process or calcification of stylohyoid ligament can cause recurrent throat pain in the region of tonsillar fossa and upper neck, which radiates to the ipsilateral ear. It aggravates during consuming. This clinical condition is called styalgia or Eagle’s syndrome.